Accident Free Autocheck 1-Owner! Third Row Seats! Rear Air! Back-Up-Camera! Leather! Thank you for visiting another one of Arizona Best Cars exclusive listings! 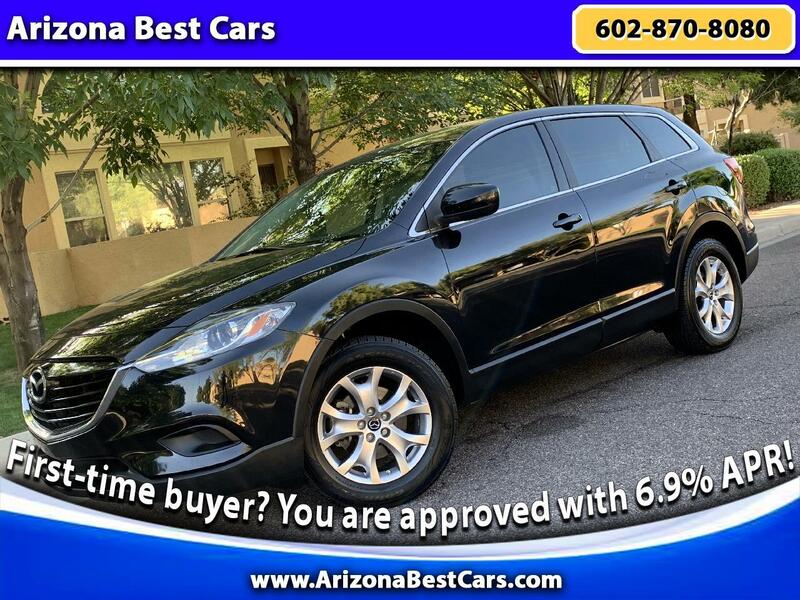 You are looking at a pristine Jet Black Mica-On-Sand Leather Heated Seats 2014 Mazda CX-9 Touring 3.7L V6 DOHC 24V Luxury SUV with 92000 Low Miles. Car Looks And Runs Great, This Is A Must See! Affordable Super Clean Luxury SUV. You won't find another vehicle like this with lower price! This car has successfully undergone a rigorous pre-buy inspection. The interior of this vehicle is virtually flawless. Check out this gently-used 2014 Mazda CX-9 Touring we recently got in. Accident Free Autocheck 1-Owner history means peace of mind all the time. This 2014 Mazda CX-9 Touring enjoys a host of features, Bluetooth, Keyless entry Consumer Guide Best Buy Luxury SUV. READ MORE!======THIS 2014 Mazda CX-9 Touring IS FULLY EQUIPPED:Leather, Third Row Seats, rear wiper, chrome exhaust tips ; seat release, second row bench or second row bucket, power release only; and IntelliBeam headlamps, audio system with IntelliBeam headlamps, , power release second row seat, 7-spoke chromed aluminum wheels , sound compression, CD-R and CD-RW capability, LED backlighting display, MP3 capable, Satellite radio,Steering Wheel Mounted Controls, Hands Free wireless, AUDIO SYSTEM AM/FM/XM STEREO: with CD/DVD/MP3 player and full-featured touch screen , seek-and-scan, digital clock, auto-tone control, Radio Data System (RDS), Digital Signal Processing, voice recognition. More information about the 2014 Mazda CX-9 Touring: Strengths of this model include interior comfort, fuel economy, extreme efficiency, Acceleration, and luxury and technology features. Thank you for choosing Arizona Best Cars for your next vehicle purchase. For further questions or inquiries about this vehicle please call 602 870 8080. Check out our entire inventory of LUXURY CARS at ArizonaBestCars.com.